October, 2012: Forty pilot whales beached themselves on the 21st of October. 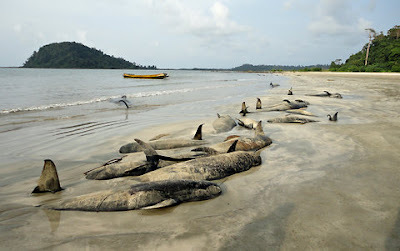 They died in the sand inside Elizabeth Bay on North Andaman Island on the western banks of the Andaman Sea. This is the first time that such a large number of whales beached in the area. On 29 September, a magnitude 5.3 earthquake occurred South of Nicobar Island at 6.180N;92.764E. The quake was listed at 14km deep +/- 12km and well within the whale-dangerous zone. Since whales injured by rapid and excessive changes in ambient water pressure lose their ability to navigated immediately after the injury, their swim path is always downstream and under direct control of the surface currents. 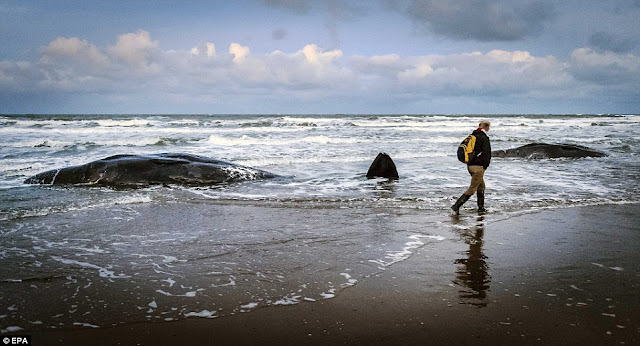 This means there must be clear evidence that the source of the barotraumatic injury is indeed upstream from the beaching site, and that the distance traveled downstream corresponds with the speed of the current and the swim speed of the injured whales. In other words, many factors much agree, otherwise the quake has to be disqualified. Following the surface currents, the distance from the epicenter of this quake to the beach is about 1,000 miles. The time of travel should be about 10 days at ~100 miles per day. The quake occurred on 29 September. The whales beached on 21 October--22 days later, more than twice as long as it should taken them to reach Elizabeth Bay. The time and distance traveled does not agree. The solution is simple. There is upwelling along the shores of the Andaman Sea. Surface currents general flow out to sea during upwelling. This would have kept the pod a few miles offshore. Following the chart of general circulation above, the pod could have easily made a complete loop around once and then returned back to Elizabeth Bay. They could circled around inside the Andaman Sea, or went outside and around the Bay of Bengal and returned to the area of the stranding 22 days after the earthquake. The time for a complete loop around once and return back to the area of beaching agrees with the time and distance traveled. This also agrees with the average beaching that occurs about 25 days after the pressure disturbance. This 25 day average is though to be because the whales are more fresh and aware of where they are for the first few weeks. The become more lethargic and inclined to beach as their ordeal wears on. High winds, reported during the time of the beaching, overcame the upwelling. After the 22 days at sea, the whales were tired and stress and were blown into the bay where they beached.